Hey girls. :) A few days ago I received my package from Hong Kong! It's from daphnecollection2011 again. I'm really excited to show you these products! If you click on the title of the product you'll be sent to daphne's webshop where you can read more about these produtcs, because I'll only be telling you my personal opinion on these. The first thing I got was the "Transplanting Gel & Natural Fiber Mascara"
The packaging of this mascara is really fancy, it looks like a glasses case and on the inside there's an elastic band so the mascara's stay inside. There's 1 regular mascara, and one fiber mascara. your lashes longer and thicker! 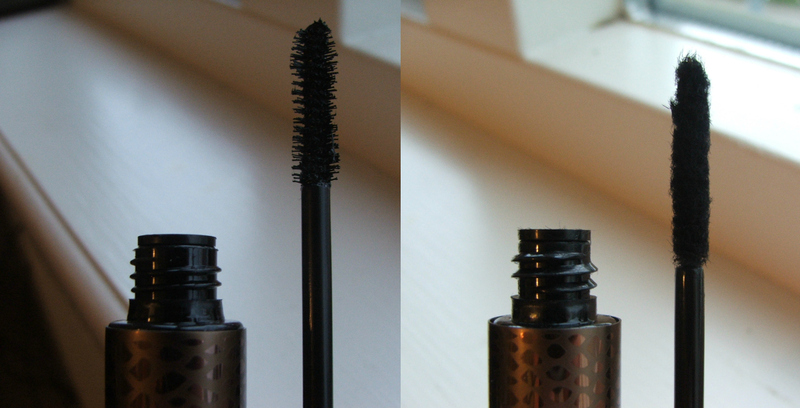 This is what the fiber mascara looks like up close. The small hairs/fibers will stick to your wet mascara and help to lengthen your lashes. I've never seen something like this before! The next thing is the "Bichun 8 Color Metal Shimmer Eye Shadow"
I love the modern packaging of this palette. It's really stylish. The colors are gorgeous. They're really shimmery and well-pigmented. The colors are over-sprays, but underneath the later of glitters are really nice shimmery colors. These colors are great to wear everyday! These are some swatches. As you can see the colors are glittery/shimmery, I like wearing the second color on the right and the first color on the left a lot, because they're really shimmery and they brighten up your eyes a lot! I also received another Bichun palette, it's the "Bichun 12 Color Cream Eye shadow Diamond Shimmer Palette"
The packaging of this palette is in the same style as the other one. I like it! These colors are truly amazing! They're really pigmented and there's a great variety of colors. These colors are also over-sprays, but as you can see on the photo below they're really shimmery, also underneath the layer of glitter. I love these colors, and they're great for party looks! The last thing is this gel eyeliner! "Professional New Waterproof Thick Eyeliner Gel"
I LOVE this packaging. It's so pretty. :) You'll feel like a real princess while using this! This is what the eyeliner looks like, it's black, deep black. The formula is hard and creamy, and really easy to work with. I stopped using gel eyeliner a while ago, but I think I might start using it again now I have this one! Here you can see it's really deep black, you get a brush with it, and you can easily create thick and thin lines with it. The eyeliner is great, I still use it every day! Thanks for letting me know about your review. I wish the microfibres I got were black.such a great idea!